Over the past holiday season, one of my daughters became interested in reading some old Life magazines that were at her grandparents home. Given her interest, we headed out this past weekend to an old book store to see if we could find a few for her to have at home. We found no Life Magazines, but did find several National Geographics. What a great source of pen history can be found in these magazines, as well as many old magazines. A quick scan of ebay will show a large amount of sellers of pages cut out of old magazines for vintage fountain pens. As we scanned the magazines I noted that there were many advertisements in the pre-depression years and post WWII years, which would make sense from an historical perspective. As an aside, the auto ads of the late 1920s are very cool. Just like pens, there were many auto manufacturers that did not make it through the depression years. The most accurate way to date our vintage pen collections is from Pen Company literature such as catalogs and production records. Of course, not all of us have direct access to these and have relied on the kindness and hard work of past collectors who have shared this information with us all. Another way is to look at old advertisements such as these to confirm the historical place of our collections. Below are two photographs that I took of pages from the National Geographics, which have images of pens in my collection ~ both have been in my collection for quite some time and not covered by previous posts as they were restored prior to 2007. The first is from a March 1944 issue and it promotes the Sheaffer Triumph ($12.50) pen. I have a brown and a red one of these models. They are great pens, as they hold a lot of ink. I do not own a pencil as shown, however. Pictures of the red plunger fill and both the red and brown pens follow the advertisement. 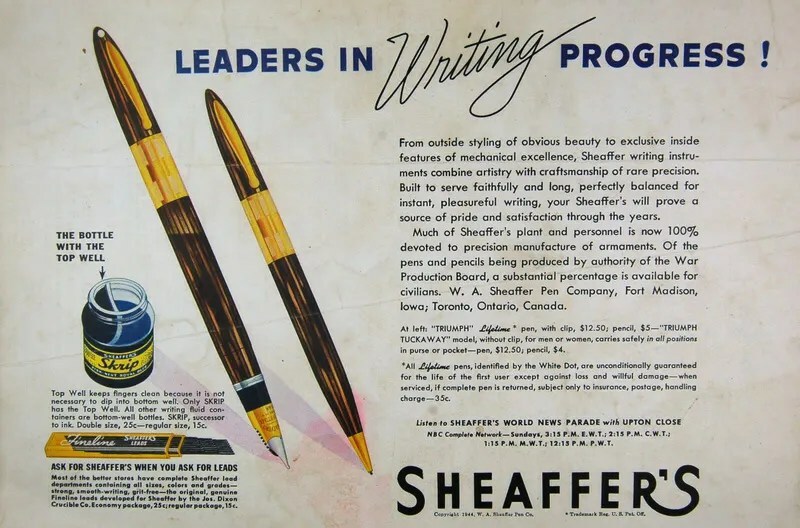 Of particular interest in the ad is the statement that “much of Sheaffer’s plant and personnel is now 100% devoted to precision manufacture of armaments.” During the war, materials used in pen manufacturing were in shorter supply as they were used in the war effort, and Pen Companies such as Sheaffer devoted many of their facilities, equipment, and available employees to making parts for the military. 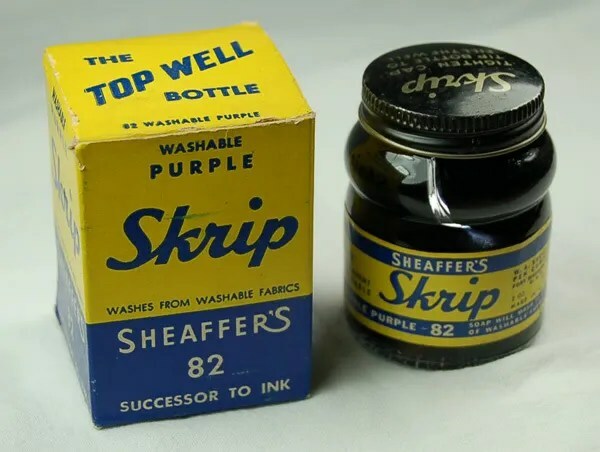 The above Sheaffer ad also promotes pencil lead and Skrip Ink. Directly above is a bottle of ink from my collection that fits this time period, as also confirmed in John Bosley’s Book, VINTAGE INKS, which places this bottle and box in the 1944-48 time period. Click on the title for a link to his website. The next advertisement is from a March 1928 National Geographic. 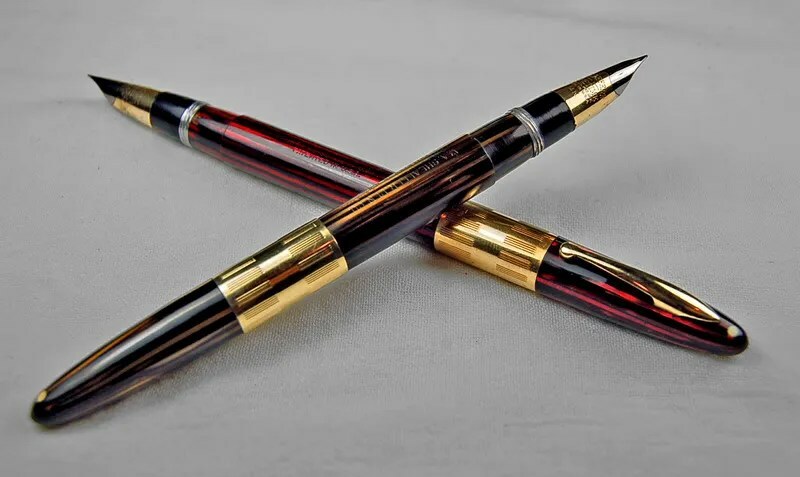 It promotes one of the most famous pens in fountain pen collecting, the Parker “Big Red” Duofold. Ah, if only we could purchase on of these for $7.00 now. Not to mention the Mandarin pen inserted at the bottom left. The big red is the most famous of the Parker 1920s Duofolds. The hard rubber version is especially sought after. This ad depicts the Non-Hard Rubber, Permanite material. It is advertised as being 28% lighter than hard rubber. What I find most interesting is the claim that they are non-breakable. Stated: “We have thrown these new Duofolds from an aeroplane 3,000 feet aloft and not one has broken“. I suspect they mean that not one broke in the actual act of throwing, and not upon landing. Anyone who has restored a number of Duofolds knows that they are to be treated with care to avoid any cracking. Here is a photo of a Hard Rubber Duofold from my collection. Not the exact pen depicted above, but the predecessor model from a few years earlier (and 28% heavier). I was able to capture many more pen and ink related advertisements ~ most of pens I wish I had. So the next time you are coming up empty looking for fountain pens at a flea market, antique store, garage sale, or estate sale, you can spend some time looking for old magazines and searching for a $7.00 Duofold. 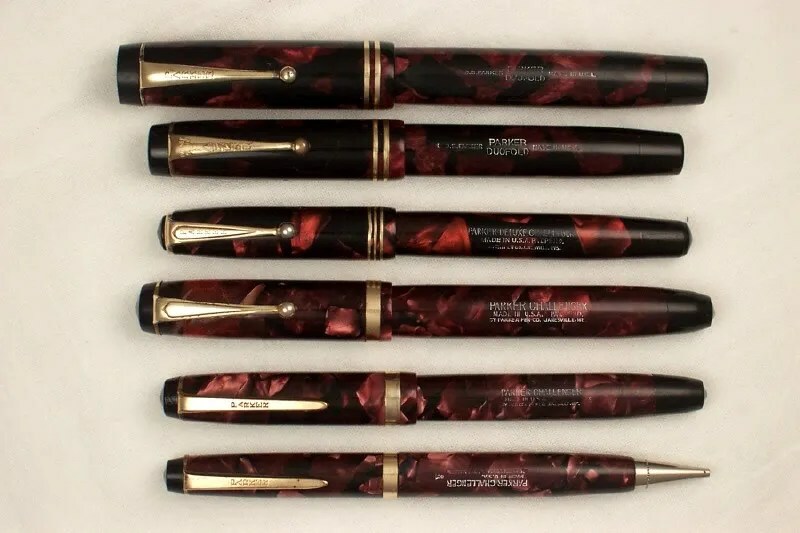 Parker Duofolds were Parker’s flagship pens starting in the early 1920s. Original colors were Orange and Black. Hard rubber was phased out and plastic (Permanite) became the material of choice in 1926. In 1927 the Duofold line of pens added Jade Green, Mandarin Yellow and Lapis Lazuli Blue to the colors of Senior, Junior and Lady Ringtop versions. Today the Blue and Yellow versions are the hardest to obtain in decent condition. The Mandarin Yellow is even more difficult to find than Blue and is prone to cracking, especially on the cap. Up until acquiring this pen, I had restored numerous red, jade, black, black/pearl (a new color added in 1928), and red/black/pearl Duofolds. I have always wanted to obtain the blue and yellow colors, but prices are quite high on them. About a month ago I ran across this Lapis Blue Duofold Junior at a very reasonable price, in line with its rough condition. As you can see, the internal pressure bar had deteriorated and I did not bother to include the old sac in the picture as it was basically dust. 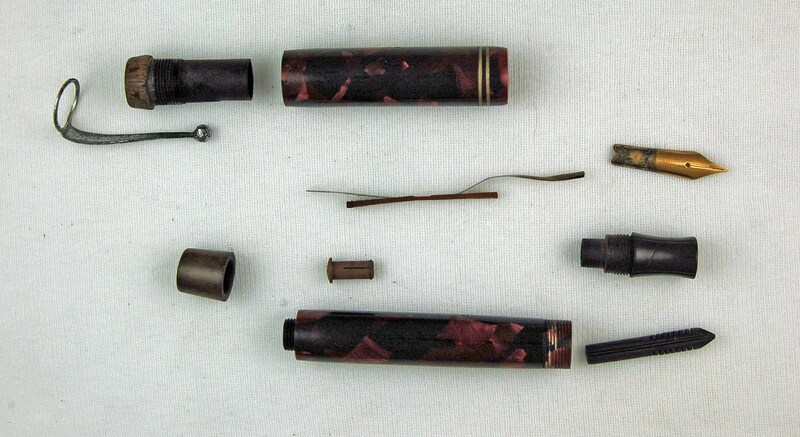 Note that the hard rubber blind cap, section, feed, and cap end are all discolored to brown. This is due to probably a combination of factors. Contributing would have been the ink that was left in the pen and dried into the rubber as well as where the pen may have been stored. Any dampness, temperature change and light could have also contributed to the destruction of these parts. The good news is that I have several spare parts from Duofolds (in this case Duofold Junior) that I could use. Spare parts accumulate as old pens with some good parts start to pile up in my parts chests. About three years ago I picked up a bunch of Duofolds in very bad shape. Some had cracked barrels, were without caps or nibs. But each had a few good parts. Typically, I was able to salvage buttons, sections, clips, blind caps and nibs. With this pen I wanted to duplicate the exact blind cap, section. feed, and cap end as in the original. Duofolds came in many different versions over the years and these parts differ significantly from year to year. As you can see from the pictures below, I was able to find matching parts for each. As with all button fillers (see also my post of 12/29/07) the repair was straightforward. I cleaned the inside of the barrel and cap to remove any residual ink. I then polished the nib, clip, and button using simichrome and a dremel. The clip and nib are 14K gold and there is no problem with being a little more aggressive with them to clean them with a dremel. I used just a q-tip with a small amount of simichrome on the cap rings, however. After scraping the remnants of the old sac from the section and cleaning the inside of the section with water and q-tips, I reinserted the nib and new feed into the section. I then attached a 16 silicon sac to the section, cutting to size so that it would fit to just short of the button hole at the end of the barrel. I coated the sac with pure talc prior to screwing the section (note that most Duofolds are screw-in sections as this is very important when removing the section at the beginning of a restoration project) back in to the barrel. Talc will aid in inserting the pressure bar and keep the sac from adhering to the sides of the barrel in the future. The new pressure bar was then inserted through the end of the barrel through the button hole so that the bar rests on the end of the section. It is important to smooth the end of the bar so that it does not cut into the sac at the end of the barrel. The button is then placed on the pressure bar so that it fits in it’s slits. After this process it is a good idea to test the pen with water by placing the nib/section in tap water and depressing the button. Bubbles should appear as the pressure bar presses against the sac and pushes air out. As the button is released and the pen is held in the water, the water should replace the air in the pen. After the pen is removed from the water, press the button again and a nice stream of water should squirt out of the pen into the water again. If this is the case, you have successfully restored the filling system. I tested this pen and it works well. The blind cap was screwed in over the button, the cap end screwed in over the clip and the plastic was polished and a coat of carnuba protectant buffed on gently. A final touch of white crayon was rubbed over the imprint for highlight. The only restoration that was not possible, as in so many vintage pens, was the discoloration (darkening) of the permanite plastic due to the deterioration of the sac and ink. There is no reversal of this, but I am happy to finally have an example of a Lapis Lazuli Duofold Junior. Research indicates that this version dates to 1929 or after, given the two cap bands. At that time, it sold for $5.00. .
My spare supply chest still has several Duofold parts. I will keep my eyes open for a Blue Senior Duofold and maybe even a Mandarin Yellow. Gold pens are highly sought after, some more than others. Here are a couple of extreme examples. The first two pictures are of a Morrison 14K Gold Filled Flat top that measures 5 1/8″ capped. 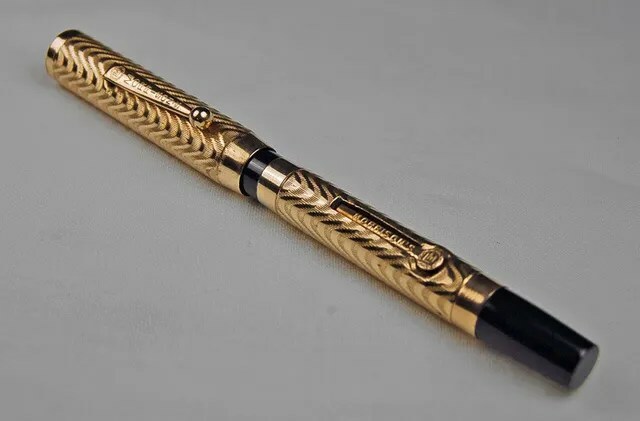 These are a nice pen to find (as well as other third tier makers) to satisfy the vintage gold need. The price can be very reasonable. I paid $26 for this pen. It did not look quite this good when I found it, but as with most vintage Morrison’s, the Warranted 14K #4 nib is a good one with a little flex and repairs are straightforward. The filler is a standard j-bar and lever and I did need to replace the jbar as well as add a size 16 sac, as the barrel is quite narrow. One needs to be very careful when cleaning the exterior of these, as the gold is a gold plate and aggressive polishing will probably lead to a worn exterior. I did minimal cleaning of the exterior and the results are satisfactory. These pens seem to be quite plentiful in varying conditions and I would suggest waiting for one with a nicely preserved exterior. This design also came in a silver as well. Just for comparison, below is a Parker Lucky Curve, probably dating to the early 1920s, in 14K Gold. Roughly the size of a Duofold Junior, it is stunning in all gold, including the section. Both pens are vintage gold, and the bank doesn’t have to be broken to find a nice, restorable example. The next pen up for repair is a Parker Junior Duofold, with a streamline cap. 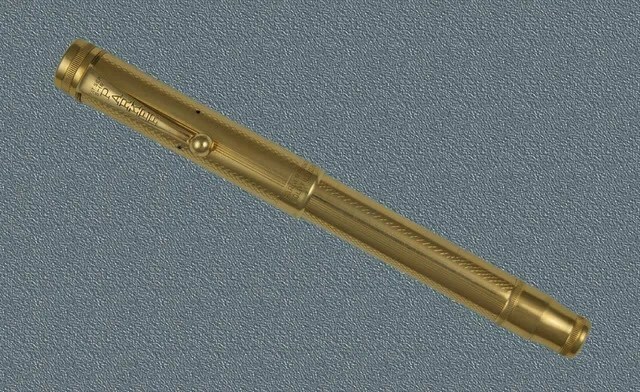 The exact date of the manufacture of this pen is imprecise, but it would have been produced in Janesville, WI by Parker sometime after 1929. Duofolds were produced in different sizes – Senior, Junior, and Lady being the most common. The Lady Duofolds of this time had a ring on the top of the cap, to attach to a chain that could be worn around the neck. The larger Senior models and the Lady versions will be covered at another time. This pen is approximately 4.5 inches long (capped). The most common colors of these pens were black, red and jade green. Other colors were produced such as mandarin yellow, blue and pearl/black. All of the Parker Duofolds of this time were button fillers. Button fillers have a sac that is filled by pushing on a button at the end of the barrel which pushes a pressure bar inside of the barrel against the sac. 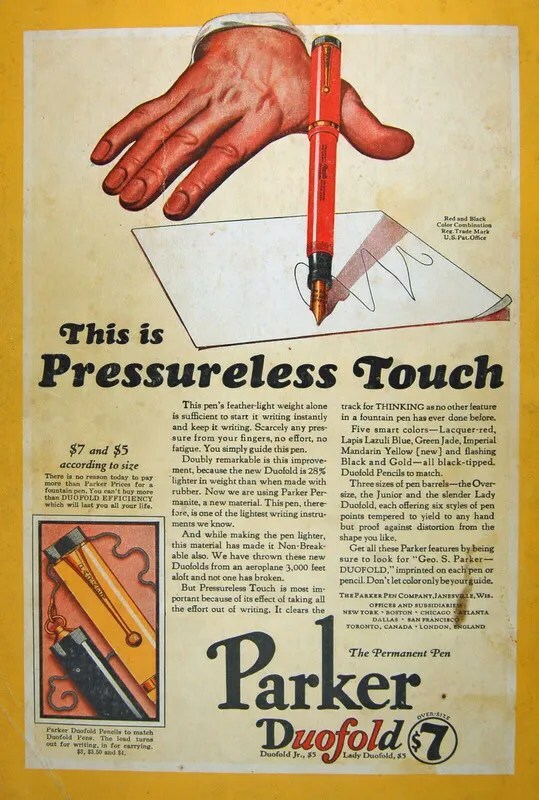 When the button is released the pressure bar releases the sac, inflating it again, and allowing the ink to flow into the pen. These pens are quite easy to restore. In most cases, all that is needed is a new sac and pressure bar. This is a picture of the pen after it has been reduced to it’s parts. I used gentle heat from a heat gun to remove the section from the barrel. Often, the section screws into the barrel, so care needs to be taken not to just pull the section out, but to screw it out gently. As you can see, the sac has hardened over the years, but the good news is that the pressure bar (at the bottom of the picture) can be used in the restored pen. The first task was to clean the gold pieces. I used a q-tip and simichrome to polish the nib, button and clip. After polishing, I put them in an ultrasonic cleaner for a couple of minutes to give them a clean shine. I next cleaned out the section and “christmas tree feed” with water and dried them with the gold pieces. Finally, I polished and waxed the barrel and cap. I selected a size 18 sac and attached this to the section with sac cement after the nib and feed were placed back in the section. Next the section and attached sac were pushed back into the barrel. Button fillers are a bit tricky at this point. I inserted the original pressure bar in the cap, through the hole in the top of the cap, being careful that it lined up next to the sac cleanly. When this was done, I placed the button over the protruding pressure bar end and pushed the button into the barrel end until the pressure bar resists. After several hours to allow the sac cement to completely dry, I tested the pen by pushing down on the button while the nib was in a glass of water. The pressure bar and button did their job and the sac filled with water perfectly. Pushing the button again released a steady stream of water back into the glass. The filling system was successfully restored. Here is a picture of the completed project, both capped and uncapped. 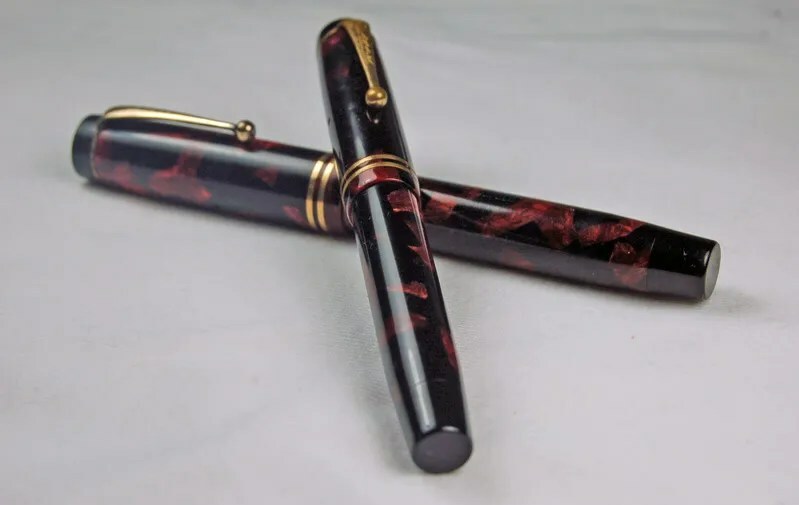 Parker Duofolds were very popular pens in their day and many fine examples such as this one have survived due in part to the workmanship and materials used in their manufacture. They are once again being produced, though using a cartridge/converter system. An excellent book on the history of the Parker Duofold is PARKER DUOFOLD, by David Shepherd and Dan Zazove.